You may have read that line in Gandalf’s letter to Frodo Baggins in The Fellowship of the Ring, but nowadays you’re more likely to see it on the t-shirts and bumper stickers of hikers. Hiking is a popular sport, and the 47 million Americans who reported that they’ve taken a hike in the past 12 months (Statista) had a lot of different trails to choose from: American Trails maintains a database of over 1,100 trails, and Backpacker‘s list of America’s Best Long Trails offers an impressive 39,000 combined miles. Plus, there are thousands of miles of trail not on either of those lists. With so many options, how are you supposed to choose? Moderate hikes could range anywhere from a few to ten miles with an elevation gain up to 2,000 feet. By those standards, a three-mile hike with a 10% grade would be considered moderate. No, thank you. Unfortunately, there is no standardized system for determining trail difficulty. Most of the time, the trail rating is a nebulous qualitative combination based on an examination of the terrain, trail conditions, length, elevation gain, and the rater’s disposition. Elevation gain is defined as the cumulative elevation gain over the entire hike. So if the hike climbs 300 feet over the first mile, then descends 500 feet over the next 2 miles, then goes back up 200 feet to return to the start, the elevation gain is reported as 300 + 200 = 500 feet. Draw an elevation map depicting a trail on which any type of hike (from easiest to very strenuous) would be possible, depending on how far a person hiked. If you were on a trail with an average elevation gain of 300 feet per mile, how long would you have to hike for it to be considered a moderately strenuous hike? If one 5-mile hike is rated “easiest” and another 5-mile hike is rated “strenuous,” what’s the minimum possible difference in elevation gains for the two trails? Students could also do a comparison between this trail rating formula and the geometric mean, if you wanted to go really crazy. Feel free to drop some of your ideas into the comments. Figure 1. The graphs for various difficulty ratings, using the Shenandoah trail rating formula. Just as every good hike comes to an end, so must this blog post. But not before we laugh a little. It’s a math joke about hiking as much as any joke about any topic is a math joke, if you insert the correct professions. A fish is hiking through a reservoir when he walks into a wall. “Dam!” he says. A pebble in a hiking boot will migrate to the point of maximum irritation. The distance to the trailhead where you parked remains constant as twilight approaches. The sun sets at two-and-a-half times its normal rate when you’ re trying to reach the trailhead before dark. The mosquito population at any given location is inversely proportional to the effectiveness of your repellent. Waterproof rainwear isn’t. But, it is 100% effective at containing sweat. The ambient temperature increases proportionally to the amount of extra clothing in your backpack. 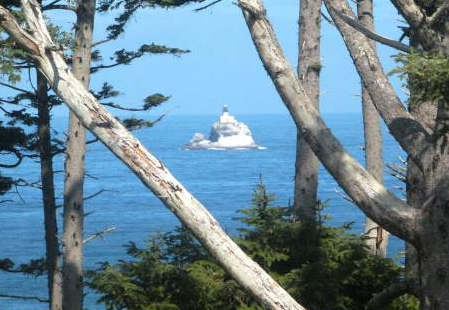 My family and I recently spent a week along the Oregon coast, where we hiked, biked, and — of course — did some math. Ah, hell no. I’m itching for a mathy conversation, damn it, and you’re not getting off that easy! So I then asked, “How far do you think it is from here to the horizon?” Luckily, the answer to that question hadn’t been included in the display at the bottom of the hill. The sight line of the observer is a tangent line to the circle, and the point of tangency is the horizon that the observer sees. 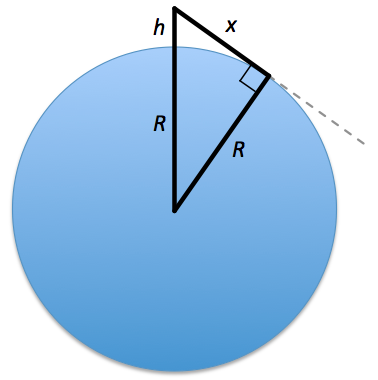 Consequently, a right angle is formed by the tangent line and radius. We now have a right triangle with which to work, so we can lean on the Pythagorean theorem. But first we’ll need some numbers. And x, of course, is the unknown distance to the horizon that we are trying to find. A rough estimate of the Earth’s radius in feet is 4,000 × 5,000 = 20,000,000, which is why that number appears in the equations above. Two things should be noted here. First, using 5,000 for the number of feet in a mile instead of the more accurate but less friendly 5,280 allows for easier calculations throughout. Second, we’re only looking for an estimate of the distance to the horizon, so we should feel free to take some liberties with the numbers if it’ll help with computation. Now that’s all well and good, and the boys were amazed that the horizon is so far away. But what if you want to generalize to find the distance to the horizon from any height above sea level? The answer depends on the math, boating, or physics book you choose to reference. It shows the distance to the horizon on the horizontal axis and the feet above sea level on the vertical axis, which I suppose makes sense from a visual perspective; but it’s more conventional to put the independent variable (feet) on the horizontal axis and the dependent variable (miles) on the vertical axis. 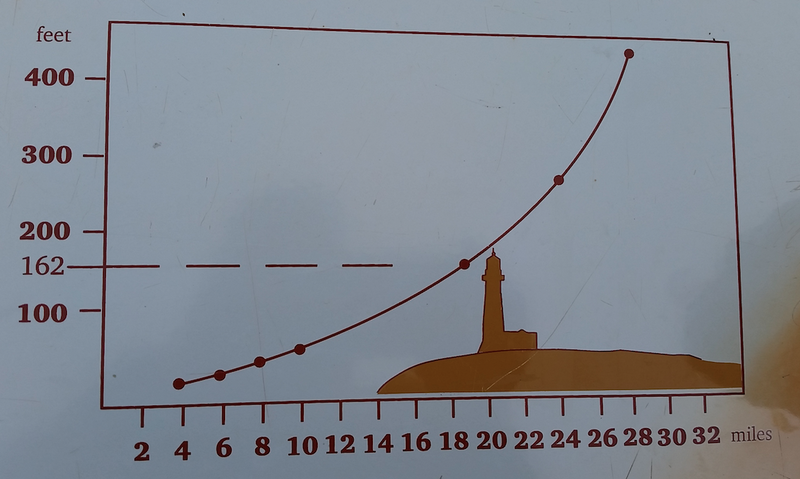 Nonetheless, the information provided by the graph is still useful, and it nicely shows that the relationship between height and distance to the horizon is clearly not linear. The differences are due to whether miles or nautical miles are used, as well as whether you’d like to account for the refraction of light, which greatly influences the distance an observer would be able to see. Personally, I prefer the first formula for its simplicity, but you’re free to use whichever one you like. Make the horizon your goal. It will always be ahead of you. A friend is taking a business trip today, and I asked if he was worried about flying on Friday the 13th. “I think it’s unlucky to have superstitions,” he replied. As it turns out, the first Friday the 13th of each year is “Blame Someone Else Day,” so if you don’t like this post, you should defintely let my wife know about it. To ensure that you point a finger at others on the correct day, wouldn’t it be helpful to know when the first Friday the 13th of the year will occur? Consider yourself lucky, because you’ve stumbled across this post. I have two methods you can use for determining which months contain a Friday the 13th. Take the last two digits of the year, yy. Determine the remainder when that sum is divided by 7. Look up the remainder in the table below. For example, in 2013, the calculations would give 13 + ⌊13/4⌋ = 13 + 3 = 16, which has a remainder of 2 when divided by 7. Since 2013 is a non-leap year, the table tells us that Friday the 13th will occur in September and December this year. Note that the table only works for dates in the 2000’s. To modify the process for dates in the 1900’s, you need to add 1 in the first step; that is, find the sum yy + ⌊yy/4⌋ + 1. Then proceed as described above. Also note that four lines in the table are highlighted in pink and yellow. Leap years always cause problems. 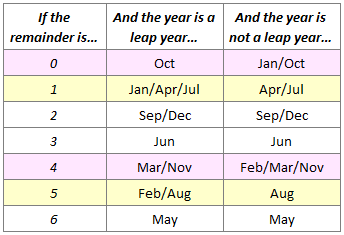 The yellow lines in the table indicate years in which an extra Friday the 13th occurs in January or Feburary because of leap year, and the pink lines indicate years in which a Friday the 13th in January or February does not occur because of leap year. Go to http://www.timeanddate.com/calendar, enter the year in question, and examine all 12 months to see which contain a Friday the 13th. I was reminded of this when my two five-year-old sons Alex and Eli, my wife Nadine, and I were playing Blokus at the dining room table, and one of us (who shall remain nameless) brought forth a sound slightly louder but a little less musical than a kazoo. “Excuse me,” said the offending party. And then both boys giggled uncontrollably until they were out of breath and red in the face. “Are farts funny?” Nadine asked, after they collected themselves. Intrigued, Nadine had a series of follow-up questions. “Are grandma’s farts funny?” she asked. Both boys answered quickly and unequivocally in the negative. “Are daddy’s farts funny because he farts a lot?” she then asked. “Daddy farts a lot, and he’s also old — that’s why his farts are so funny,” Eli explained. “But his stinky farts are not funny!” Alex insisted. All of this pontification got me to thinking: someone ought to devise a formula to estimate how funny a fart is. Given my expertise, I decided that that someone should be me. Alex and Eli had already identified three factors — frequency, age of offending party, and odor. In addition, I believe that sound quality, attractiveness of the offending party, and inappropriateness of the situation are also important criteria. But I had no idea how these components should be incorporated. To do this justice was going to require some research. According to the National Institutes of Health, an average person breaks wind between 14 and 23 times per day. (Wow!) So based on Eli’s belief that more often is funnier, but also based on my experience that there can definitely be too much of a good thing, it seems that a flatulence frequency slightly above average — maybe one fart every 40 minutes — would be funny, but significantly above average — such as one fart every 2 minutes — would be devoid of humor and, quite frankly, disgusting. Consequently, the frequency (F) in the formula below takes into account the number of rectal tremors released within earshot of another human being during the past hour (not counting the current infraction). Age (A) is a delicate issue in this analysis. Farts from very young kids can be funny, and I personally think that farts from really old people are hysterical. For people in between, age isn’t much of a factor — unless you’re a teenage girl, in which case the embarassment of a public toot would be too much to bear. The beauty (B) of the offending party, measured on a scale of 1‑10, also has an impact. No one wants to imagine — or worse, actually witness — a supermodel letting one rip. But on the flip side, most of us are equally mortified by the thought of a repulsive person cutting the cheese. The formula therefore uses a quadratic relation, so that a person with middle-of-the-road looks receives higher marks. Finally, the inappropriateness (I) of the situation has to be considered. The formula below accepts values from 1 (“whatever, no big deal”) to 10 (“oh, no, you didn’t!”). Of course, this is a highly subjective factor. While it is certainly inappropriate for a groom to pass gas while reciting his vows on the altar, it’s a whole lot funnier than releasing an air biscuit while delivering the eulogy at your father’s funeral. So I = 4.2 for the gassy groom, but I = 9.9 for the guy who shows no respect for the deceased. Put this all together, and what do ya get? For the most part, the formula will return values in the range 0‑100, so it works sort of like a song rating on American Bandstand. Yeah, it’s not perfect, and I’m happy to hear suggestions for improvement. But it works pretty well. A middle-aged (A = 45) woman with average looks (B = 6) who kills the canary for the first time that evening (F = 0) with a loud (L = 95) but relatively mild (S = 1) honk while playing Scrabble® with her sister (I = 1) would score a 49.5; and having witnessed my mother and aunt bust a gut at this very scenario on numerous occasions, my instinct is that such a score is about right. On the other hand, a man of any age who releases a silent-but-deadly (L = 0, S = 6) would score a 0 regardless of his looks, his age, how long since his last incident, or the situation. And that feels right to me, too. That sick SOB! How dare he? What do you call a math teacher who never farts in public? 1 It occurs to me that (a) I’ve spent entirely too much time doing the research for this post and (b) I now know more about flatulence than I ever wanted or needed to.